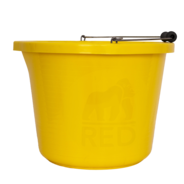 You may know us as Gorilla Tubs®, Tubtrugs®, Tyre Rubber™ or Wm.Faulks® but as of January 1, 2018, we've rebranded to Red Gorilla™. New name, same great quality products. Out Gorilla Tubs are highly recognized branded tub. Now to make it even easier to recognize among the competition. Designed to withstand harsh conditions and special tasks. Gorilla Tub® was one of many brands belonging to Faulks & Cox Ltd. After over 30 years on the market, we decided to unite all of our brands and create one strong identity that would communicate strength and quality across the whole range. This is how name Red Gorilla™ was born. We had several brands for different markets, from equestrian to building, and our customers didn't realise that all of these top quality products were from the same company. Absolutely not. The barcode and codes have remained the same, meaning minimal disruption to you! If you still have our old merchandisers contact our office on 01455 848 184 and ask what we can do for you. What to do with old POS systems? Now all of our products: flexible tubs, buckets, brooms, shovels and many more are under one logo, giving you more possibilities for cross-selling. 9am - 5 pm, Mon - Fri, you will never wait more than 3 rings for a friendly, human response. Our head office and warehouse is based in Leicestershire and can deliver as quickly as tomorrow. If you are not satisfied with our product success, we will return them at our expense. Don't wait more than 3-5 days to receive your order with our standard dispatch service. We are constantly improving and developing our product lines, helping you make more profit. Our in house marketing team can provide you with images and promotional materials. Red Gorilla™ provides excellent value for consumers and gives you greater opportunities for sales. Offering a complete range of superb quality, innovative products that are designed to the highest standards and built to last. Gorilla Tubs® are widely recognised throughout the construction industry, revolutionising building techniques with flexibility. Used by bricklayers, plasterers, electricians, plumbers, glaziers and decorators, Gorilla Tubs® are used around the world. Flexible sides allow shaping our Gorilla Tubs® to walls and floors. But that's not all. Their uses are endless and abilities limitless. We all know that they are excellent for shifting volumes and mixing plaster, but this is not where their capabilities end. 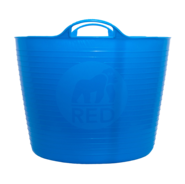 Red Gorilla™ company offers you more than only flexible Gorilla Tubs®. View our catalogue to discover the whole range of our products including brooms, shovels and tools. To order Red Gorilla™ products, please contact your NMBS agent.